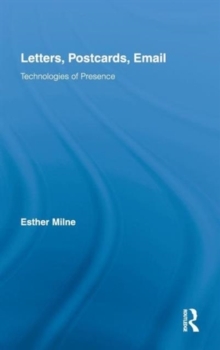 In this original study, Milne moves between close readings of letters, postcards and emails, and investigations of the material, technological infrastructures of these forms, to answer the question: How does presence function as an aesthetic and rhetorical strategy within networked communication practices? As her work reveals, the relation between old and new communication systems is more complex than allowed in much contemporary media theory. Although the correspondents of letters, postcards and emails are not, usually, present to one another as they write and read their exchanges, this does not necessarily inhibit affective communication. Indeed, this study demonstrates how physical absence may, in some instances, provide correspondents with intense intimacy and a spiritual, almost telepathic, sense of the other's presence. While corresponding by letter, postcard or email, readers construe an imaginary, incorporeal body for their correspondents that, in turn, reworks their interlocutor's self-presentation. In this regard the fantasy of presence reveals a key paradox of cultural communication, namely that material signifiers can be used to produce the experience of incorporeal presence.